Indian sales executive learns to negotiate with Italians | "Blogging by the Road not Taken"
But first, what does a Territory Sales Executive do? Responsible for different territories across Italy, a Territory Sales Executive is responsible for growing the business in his region by participating in business development activities with existing agents as well as building up long term partnerships with new potential agents. Usually, the TSE has a rotation across territories. What is a Community Consultant? In a business like the money transfer industry, your customer segments are based on the final destination of transfers which finally comes down to different national communities residing in a country. As an Indian Community Consultant, I was the expert for dealing with the Indian community. Responsible for sales & business development, I also organized marketing events across multiple key locations in north Italy targeting the Indian community successfully. 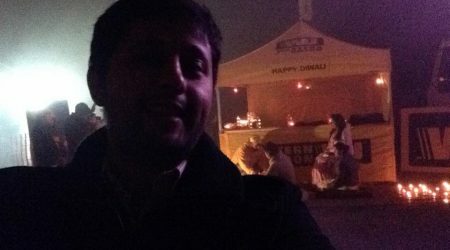 Here is me at the Saturday night Diwali function at Pegognaga, Mantova. My manager had great positive feedback about this event. What is a typical day as a Territory Sales Executive like? There is no typical day, but we do have a typical week. As a non native Italian speaker, the job was a bit more challenging for me. But I made up for lapses in linguistic abilities with strengths in sound selling points. I say this because, the responsibilities as a Territory Sales Executive is quite broad. As a fresh recruit originally hired for doing more of the Community Consultant Role, I had a lot of flexibilities to do my own market research and bring in new results. Later while I worked on key territories like Milan as a TSA dealing directly with Italian clients, my responsibilities included more of getting the contractual documents processed. Know your product, Industry, customer. Read on-line, speak with existing agents, customers, potential agents, small shop keepers etc. Do your market research properly to learn as much as you can. Always ask questions. Do your e-learning on time. Very important to understand the Western Union culture, anti money laundering checks etc. Helps immensely in determining our actions and decisions at work. Plan a weekly schedule in advance. Traveling long distances require detailed planning to optimize travel. Activities of your busy week, needs to be recorded in terms of weekly reports. Keep information on schedule, appointments, work done, expense reports, research etc. A detailed report submitted to your manager will give you more flexibility and independence as he begins to trust you more. Calling up leads to fix appointments. Can be tricky to reach busy business owners, but its important to call them before you visit and try to be a top notch sales man selling in a foreign language. Speaking confidently on the phone to communicate trust and interest is an art honed by practice. Starts out rough, but convincing them about the money transfer business is just the first win. Real challenge is getting them to complete the contractual process with all the documents. Money transfer is a highly regulated industry and requires a proper agent verification. In order to save time, I sometimes prefer to meet my lead and get the contract signed the same day. This is easier said than done. To meet a busy central Milan business man and convince him to take up a new business activity the same day he is learning about it for the first time is not an easy task. You should never be too pushy. Also definitely be ready to welcome an other appointment. The huge number of signatures, and documents required could be handled patiently at a convenient time. Prepare a check list before meeting clients. You don’t want to travel miles to only forget something. Make sure to collect all the important documents from a checklist. Write down the process you need to follow in your job. Time is money, and your supervisor prefers that you can conclude a business from a shop as soon as possible to work on other potential agents. With increasing competition, agents may be biased in using other money transfer services that have promised a higher commission to them. Good customer service will allow you to learn more about the agent concerns and complaints. Just by being a great person to work with can motivate your agents to continue to work with you. Even enthusiastically despite industry headwinds. I have personally helped calm down one of our agents who was earlier not satisfied with a customer service call on the phone. As I visited him and heard him out, he was more willing to give our service an other shot. But never entertain unnecessary information on how to make large money transfers etc. You drive a lot, so be careful. Getting speeding tickets should motivate you to plan in advance and never rush. Use word of mouth: have discovered a gold mine of leads just by talking with people. How many? Let us just say that Western Union will be thanking me for ages for those leads. What did I learn from my sales experience? We all have a style to deal with people. Some of us like to make compromises and be nicer and friendlier even though the other person may not reciprocate the same. Hoping to receive mercy in return for kindness. The other way is to make the other person think highly of you with respect. Letting the other person seek your approval and guidance in helping him. Which ever approach you choose remember that you would have to do it with loads of people. Being too nice with loads of people, puts you into high liabilities or obligations to help them with every small detail. A demanding client will try to outsource more of his work to you, when instead of doing customer service, you are supposed to be finding newer clients. My advice is that always try to take the horse to the water, but remember you cant make it drink. Be the teacher and enlighten your new students. teach the client something new and present your product as the solution. Have no clue how to go about with your sales job. Remember to always knock on the door and enter like its your first sales call. Same enthusiasm. No single way to get the job done. Head out and meet 100 clients, and you will find a bunch of really sweet people. You will also find a bunch of @$$#o£€$, some really smart and interesting people and some ignorant ones. Just by visiting all the 100 clients, you could definitely find an accord with a good percentage of them. Be assertive but not too sleazy. You have to be approachable and capable of getting things done. Never underestimate word of mouth and networking. I found many interesting deals in chit-chat.